DECO Boat Lifts offers three distinct drives for our boat hoist systems to meet our customers’ unique requirements and budgets. For example, if you’d like an entry-level system with lift capacities of up to 16,000 lbs., our Maxi Lift is the perfect choice. It offers best-in-class reliability thanks to a heavy-duty aluminum flat plate drive system. We also offer our flagship DECO Lift, which has a number of proprietary features, such as a sealed gearbox design, to provide exceptionally reliable and quiet operation. Additionally, we are proud to offer the industry’s most advanced boat hoist – the Concept CRS Lift. A direct drive significantly reduces maintenance requirements while increasing lift power. And, it comes with our patented Cable Retention System (CRS), which has deeply grooved winders, reducing wear to cables. We make it easy for our customers to incorporate our lift systems into their waterfront properties by offering them in a variety of configurations. For example, we offer a boat elevator system, which can be mounted directly to the seawall, making it ideal for areas where pilings can’t be used. We also offer a popular Beamless Lift that doesn’t require underwater cabling – a feature that reduces wear. Plus, this lift has four drive systems to achieve incredible power and performance. 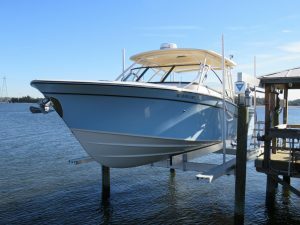 For more information about the boat hoist systems that DECO Boat Lifts offers in Myrtle Beach, NC, contact us today.